ACTIVITY in Concentration, Molarity. Last updated January 2, 2018. Find out more about this Activity in the November 2017 issue of Chemistry Solutions. I use this activity as the opening solutions unit. First, I have my students make concentrated and dilute Kool-Aid solutions. Put students in small groups. Give each group a packet of Kool-Aid powder, water and two cups. 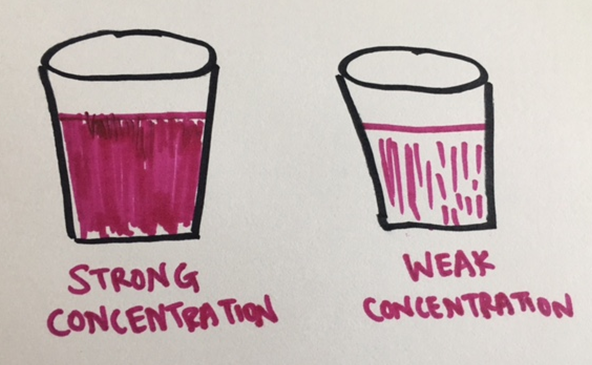 Without any additional instruction, tell students to make a cup of highly concentrated Kool-Aid and a cup of Kool-Aid that is weak in concentration. Typically, they easily do so. 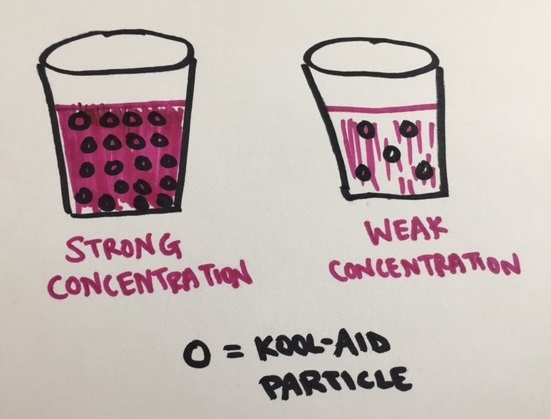 Students can communicate that the dark colored Kool-Aid is strong in concentration while the light colored Kool-Aid is weak. This is the macroscopic representation. I then ask the students to draw the particles of Kool-Aid and water in the two cups. A typical student response is shown in the first image. Through prompting I ask students to add “particles” of Kool-Aid to their drawings. This typically results in the sketch being improved, such as shown in the second image. Next, instead of giving the equation for molarity and having students calculate concentrations, students work with the particulate representation of molarity and look for patterns on their own so that they construct their own knowledge about determining concentrations of solutions. To accomplish this, share the student instructions available in the downloadable presentation as well as downloadable sets of cards. Note that these cards will have to be prepared (printed and cut) prior to the activity. Each group will need a set. You may want to print them on various colors of paper/cardstock. These cards include 18 pictures of various concentrations of solutions and cards that indicate values for moles of solute, liters of solution, and molarity. Use the presentation to direct the groups with each task, and progress through the activity. While doing this be sure to check-in on groups to ensure understanding and progress. Student should find that each dot in the picture of the solution represents one mole of solute. Students should be able to find the matching picture card, the correct mole value card, and associated liters of solvent card that defines the given concentration. Once students are proficient with identifying concentration with the picture, moles, and liters cards, I asked students to divide the fraction of moles/liters. Many students already make the connection of the fraction of moles/liters and begin to use the molarity cards without knowing what the “M” stands for on the molarity card. There are a variety of combinations of cards that could be used to describe most concentrations. After this activity, students were then asked to calculate concentrations via a traditional worksheet. Read an article about this activity in the November 2017 issue of Chemistry Solutions.